The OEM WRX plastic endlinks are week and will flex greatly after installing a stiffer aftermarket swaybar. This flexing makes your stiffer aftermarket swaybar feel less responsive. PERRIN endlinks are 6061T6 aluminum arms which provide a solid no-flex connection between your swaybar and chassis. This translates into a more predictable and better handling car. The low profile, weight saving design of PERRIN endlinks allow for ample clearance for even the largest diameter sway bars. PERRIN endlinks provide a solid No-Flex connection between your sway bar and chassis which translates into a more predictable handling car. PERRIN Sway bar endlinks are machined from solid 6061T6 aluminum and feature spherical type bearings. These spherical bearings are the same kinds of parts you would find on a no compromise race car suspension. 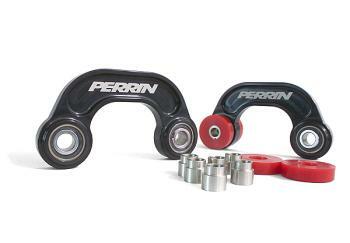 The low profile design of PERRIN endlinks allow for ample clearance for even the largest diameter sway bars. PERRIN endlinks feature Teflon lined spherical bearings which provide the necessary articulation angles while maintaining a smooth resistance free sway bar motion. These precision bearings are use to provide a solid connection from your swaybar to the chassis compared to flexible rubber bushings. Each bearing is held in place using spiral-lock bearing retainers to ensure they will NEVER come out of the body. Included with PERRIN endlinks are 4 urethane bumpers. These bumpers help keep the endlinks entered which ensures proper clearance between all aftermarket swaybars and our endlinks. This small feature is not found on our competitions spherical bearing endlinks!